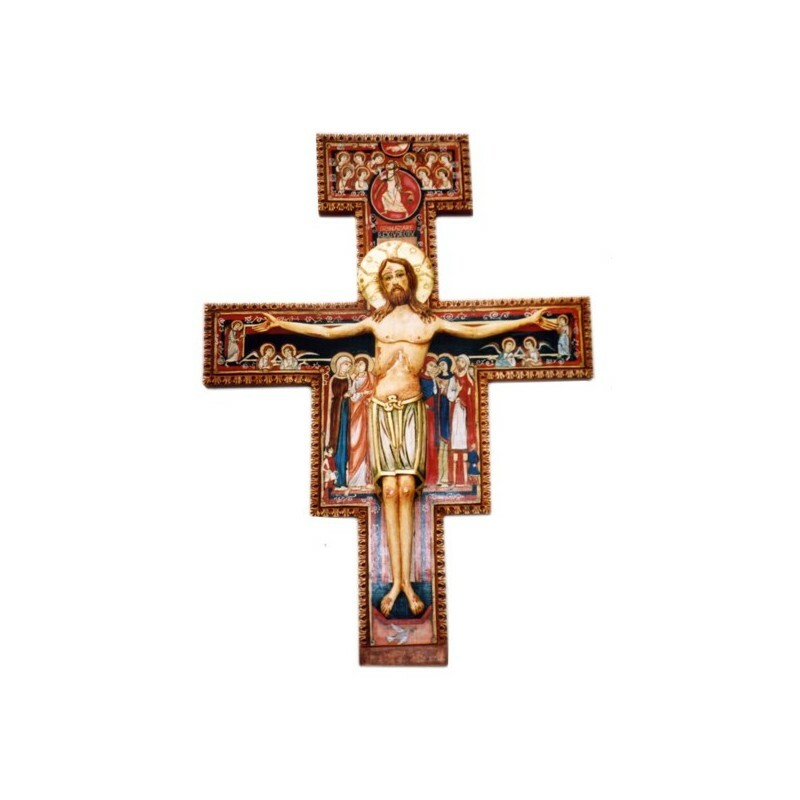 Caved wood crucifix, handpainted, available in various measures. 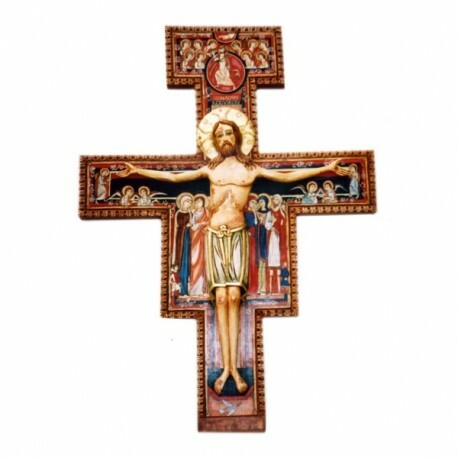 The artist name of the San Damiano Crucifix is unknown. This work is placed around 1100 or so. 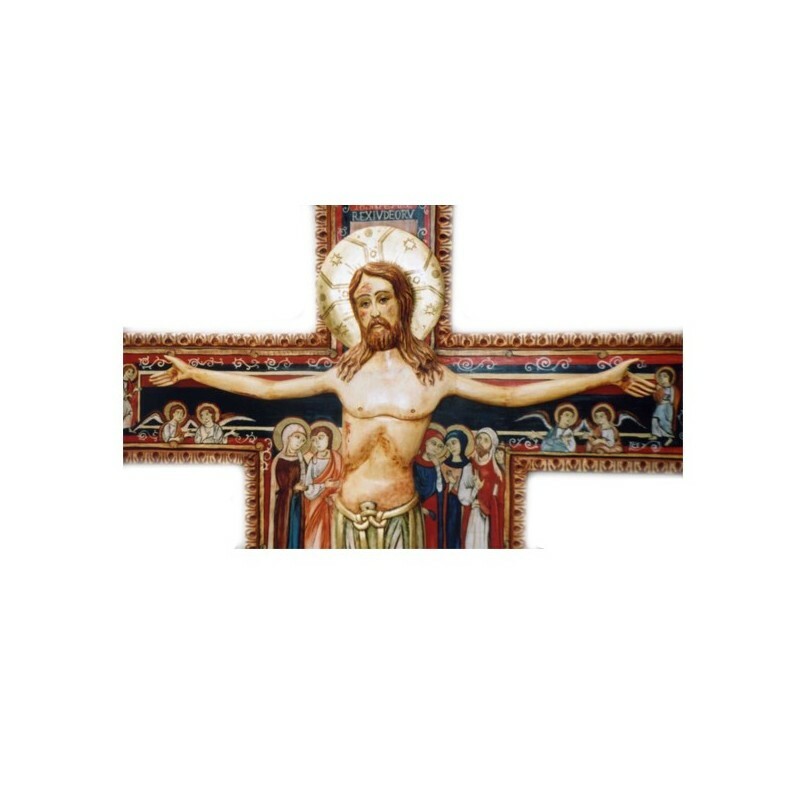 The Byzantine style was common in Italy at that time and the purpose of a cross made with icon was to strengthen the faith of the people. Jesus is portrayed simultaneously hurt and strong, in fact, this work is not dead, but he's right and his halo includes the image of the cross glorified. The importance of Jesus is enhanced by the bright color of his body in contrast to the red and black around. Christ is represented in its full stature, while the other figures are reduced in size but have different sizes: the larger ones are the five witnesses to the crucifixion of Jesus as Lord, and (on the left are Mary, St. John, while on the right there are Maria Maddalena, Mariadi Cleophas and the centurion); the three smaller figures are the witnesses of the crucifixion (bottom left is Longinus, who pierced the side of Jesus, right Stephsn, the one who offered the sponge soaked in vinegar to Jesus, the third is the face of 'artist); among other figures are represented 6 angels and 6 patrons of Umbria and Inalto 10 angels that give the well came to Jesus in the Kingdom of Heaven.